I have talked and talked about this room makeover for so long that I am sure you are all sick and tired of it. This is a makeover that is being done one piece at a time to fit my budget. This isn't an urgent need, the room is really fine, it is just a want, so little by little I am inching my way to getting this done, so I need some input from you guys. 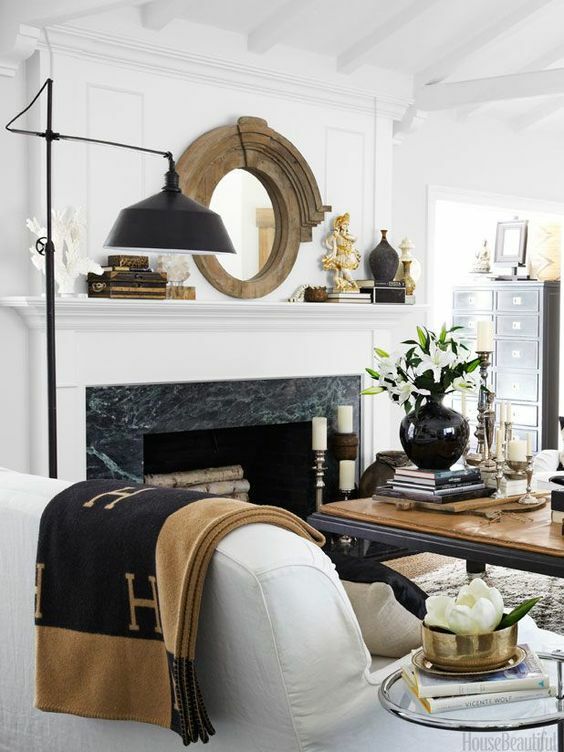 This is the inspiration board for my family room. I really want this room to have a gray and camel color scheme. That is my very favorite and I have wanted to create a room with those colors for years. With my new cream colored sofa, I think I can finally do it. Added to the mix that doesn't show on my inspiration board is a new chair that I just got. It will go on the other side of the tv console - next to the sofa. This has a weathered wood finish with a light gray seat upholstery. The two charcoal recliners for the other side of the room I hope to get in a couple of months. This is the chair that I am going to make over. This is a piece I've had for a few years and is another great find from Hotel Liquidators. It was $59 and a bargain. Love the style, it just needs to be updated. I plan on painting the wood the same as the new chair in a weathered finish, then what about upholstery- - - white, gray, dark or light - solid or with a pattern. Give me some suggestions. I want the camel and gray color scheme to go with my horse picture that I love so much. 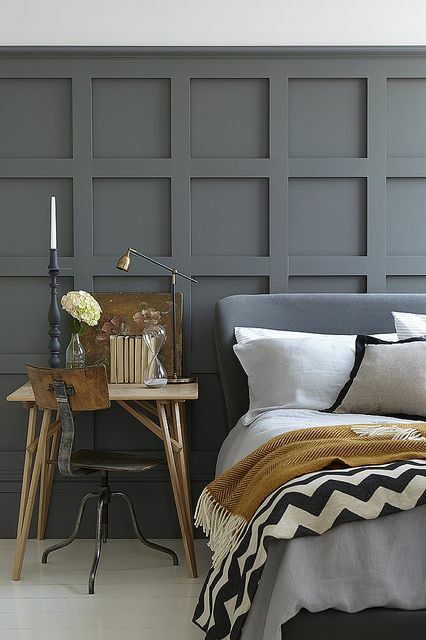 Here are some inspiration pictures of the color scheme that I love and want to achieve - a gorgeous combination of gray/camel/black/white. Thanks for the help, you guys are always spot on with your advice. Love the new color scheme. You've got magic hands ... can't believe you did that with paint. It's so good! 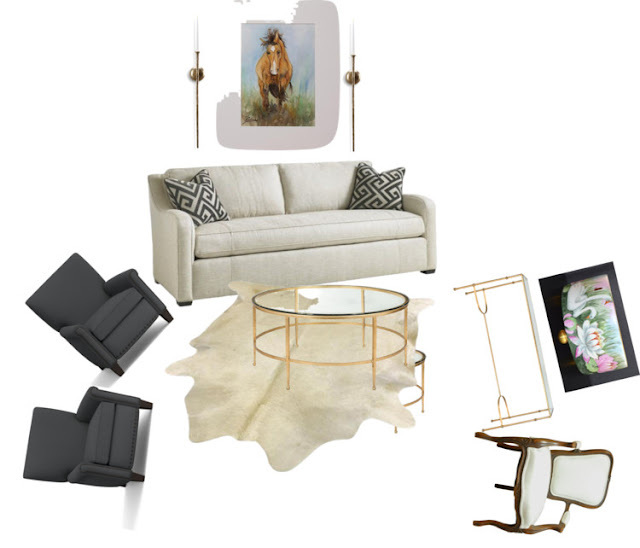 Why not use the cowhide rug on your new chair. That crease in the rug would bother the heck out of me. Why not do it in a black and grey tweed? You love accents in black. Would a black/grey check be too much? I just love your room! A black/grey combination would be perfect in my humble opinion. I love black worked into a room. How about using the same print that is on the bed pillows -- the zebra print. I actually have a very simple chair done this way and it is fab. I think it would be killer in your space. Since you’ve been creating a little more modern feel to the design I’d look into a geometric pattern of some sort with a combo of either a black or gray and creamy white. Now, I know you are going to think I am crazy (and yes---I am a bit) but have you considered painting the upholstery until you decide exactly what you want to do. The 'texture' will show through but the fabric won't. I have used regular latex paint and sanded between coats-let it dry and after about three coats it is perfect! I have two pieces that have been painted for about 15 or 16 years and they still look like new---both are in an off white and with the fabric they are on they took on a 'tweed' appearance. My daughter has one and I have one in storage as we prepare to move. If you are dead set on upholstering, do you have any of that fabric that is on the other chair or sofa? I like that--or even a grey velvet would be nice. I think. Velvet is making a big comeback, I see. Love that color palette you've chosen. it's one of my favorites too. the chair is gorgeous. Since the other pieces are solids you could do a print easily, the idea of a tweed or very small pattern would be wonderful! I really like the fabric covering the chair in your first inspiration photo. The fabric is also on a pillow and used as a bed scarf. I think a large graphic pattern in those colors would be fabulous with the curvy lines of the chair. I have nothing to add because I love all of the suggestions for the ladies above. Your room looks fabulous and I know whatever you decide will be fabulous. There are so many great suggestions here for you to ponder. I see a black background with a small to medium design in camel that will blend with the refinished wood. You can always use the larger patterns in pillows and/or throws. It just seems that a very large print would over power the chair. Your inspiration pictures are definitely inspiring. Marty, the room already looks wonderful, and I'll look forward to seeing what you do with that pretty chair. I know you'll do something fabulous with it. I love the zebra print like the pillows in one of your inspiration photos. I feel like animals prints mix into any room. I love the color scheme you are working toward, Marty. I think a very muted pattern on that chair would look lovely.